Every now and then I'm scrolling through one of my homeware faves and I discover a whole load of products I didn't even know existed. That's what happened today when I found some totally cute pieces on the Debenhams site. Like seriously I want/need them all! 1) Two white 'Cosmo' Stacking mugs £18.00 [x] : I could write poems about stacking mugs I love them that much. These even have an adorable pop of pastel pink and blue on the inside! 2) White 'Cosmo' Eiffel Tower Vase £18.00 [x] : Safe to say that this isn't the most practical vase by a long way but it's so cute that I couldn't not include it. May not fit all your flowers but it does make a great ornament. 3) Multi-Coloured marble effect 'Cosmo' Cushion £22.00 [x] : Ooh la la, I am in love. Just look how gorgeous that marble effect is, and it's even super soft too. Love love love. 4) Pack of four multi-coloured marble effect 'Cosmo' coasters £14.00 [x] : Coasters are always a good idea, especially when they're pretty too. 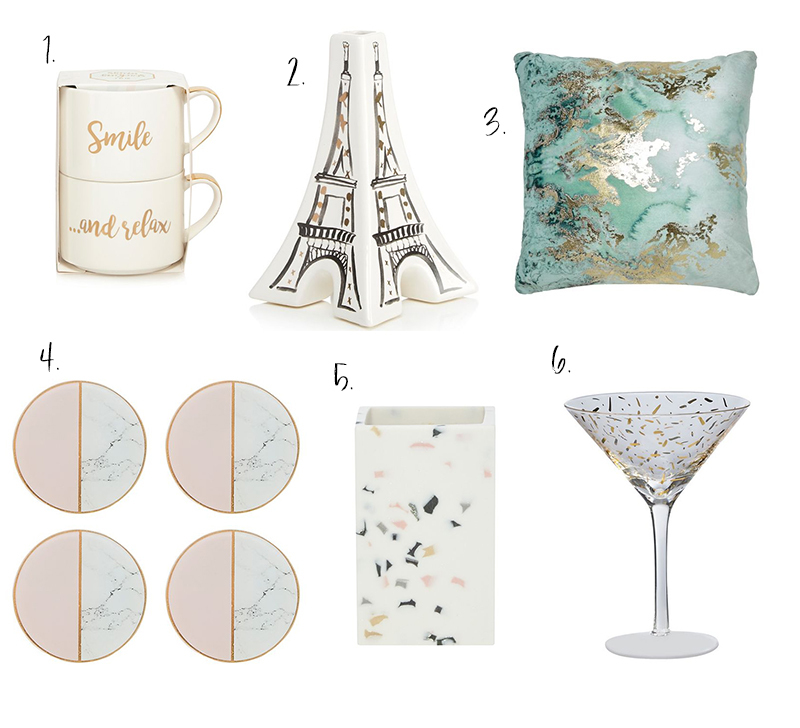 So I definitely have my eye on these gorgeous marble effect, pale pink and gold coasters. 5) White Speckled 'Cosmo' Toothbrush Holder £8.00 [x] : It's hard to find stylish accessories for the bathroom but Debenhams have really hit it on the head with this luxe and chic toothbrush holder. 6) 'Cosmo' gold confetti set of 2 martini glasses £20.00 [x] : Martini anyone? One of the things I adore about this collection is the adorable and fun confetti print which is the perfect match for an extravagant martini glass.